Why Is A Greenscreen Green? Ever wondered; why is a green screen green? The first question I’m asked when people walk into our remarkable infinity cove studio is “why is green screen green?”. The truth is, in reality, it doesn’t have to be. Keying is the removal of a solid colour in order to replace it with something else; as the name “Chroma” indicates it means the “colourfullness” of the image and that areas of similar colour can be removed. You can key on any solid colour; orange, white, maybe even beige! The issue is that when you remove this colour by use compositing software or our green screen live keyer then all associated colours are affected. So if a person is keyed from the colour orange, away goes the orange, away too does any orange in their skin pigment. 9 times out of 10 the object you’re removing is the background and the foreground whose colour you’re trying to protect is human coloured. Green is the colour furthest from human skin; hence green screens are green. Then why is a blue screen blue? Ok. So the principle here is the same. Blue is far away from human skin tone but not assssssss far away. What’s more blue is EVERYWHERE! Daylight has a strong blue element. Don’t believe me? Then look at the sky. A primary ingredient of daylight and therefore daylight lighting is blue. So if you’re trying to composite a person into a sunny, well-lit park and you light them with daylight lights against a blue screen you’re asking to lose skin tone. Therefore green screen began to replace blue screen. Funnily enough, the picture that brought green screen to great prominence was “Superman: The Movie”. Why? Well, his suit was blue and the Man Of Steel would vanish in all the effects shots! Why is an even green so important? Enough of the questions already! Ok. Just this last one. The flatter the green the “easier” it is to colour pick the one shade of green. The key (pun intended) to an even key is even light; no hot spots of too much light and around 2 stops from the subject you’re filming. 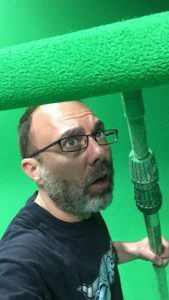 There’s a greater discussion of lighting principles here in my blog about green screen video production. The fly in the ointment and why green screen causes such a wringing of hands is that the human eye can detect more variances in the colour green than any other colour. It’s a genetic call back to when we lived in the trees and needed to be constantly on watch for predators. That’s why when you book the green screen studio be prepared for a lot of discussion on what colour green everyone’s aiming for!